An integral part of any relationship is the shared history between two people and when one of those people is living with dementia, that shared history slowly becomes lost. We encourage the use of life story books to help preserve the memories of those with dementia. 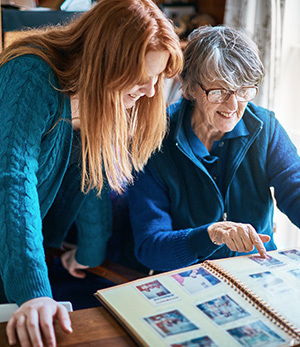 A life story book, filled with photos from the past, can bring joy to a person with dementia and help them to rediscover a sense of belonging. They are also a wonderful way for family members, friends, and support workers to connect with a person living with dementia. A life story book is a wonderful way to bring back memories for a person living with dementia, and at the same time provide useful information to caregivers about that person. It can be as simple or as complex as you wish to make it. Start with photographs of the person and a description of their history. Keep information positive, avoid tragic events or memories that may cause the person distress or emotional upheaval. Organise the information into a photo album, scrapbook or by using an online photo book service. Include a variety of photographs from the person’s past and present. These are some of the things to consider including in your loved one’s life story book, or for more detailed instructions you can download our 14 page guide. What should I include in a life story book? The guide also includes templates that would be useful for staff in a care setting, such as personal care preferences, likes and dislikes, and health.